There’s no secret about what hiring managers want to see in your resume; the trick is making sure you’ve done the right research and are prepared to put what you’ve learned into practice. Ideally, you will correctly include the right specifics, keywords, and personal descriptions in your personal document. Sadly, many resumes don’t live up to the expectations of hiring managers, but you can avoid this costly mistake. With the aid of our Word 2016 resume templates, you’ll use the right content and most logical formatting for your desired industry. 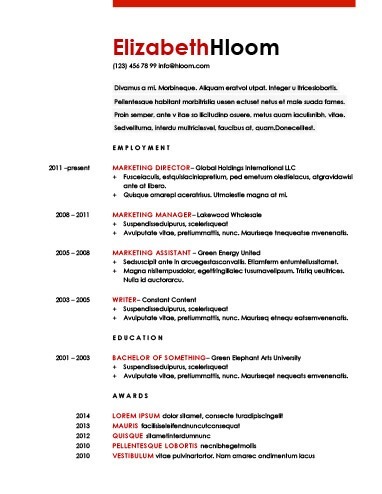 Use all of the available resources to write the best possible resume. Use our templates and writing guides to give your document the professional distinction that sets it apart from other resumes and puts you in the right position to gain interviews in your quest for comfortable positions. 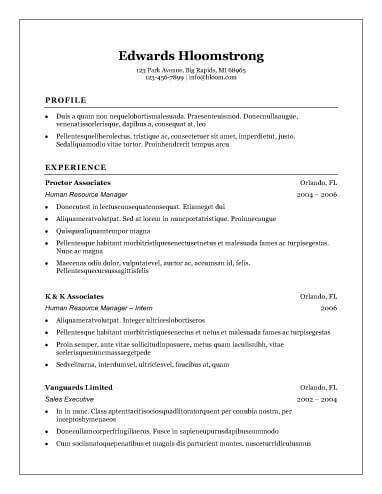 Why Use Word 2016 Resume Templates? The job market today can be very competitive, even when there are plenty of jobs available. If you have a distinguished career and a lot of achievements, it makes sense to create a long list, detailing all of those skills and accomplishments. However, today’s hiring managers spend very little time on each resume. Rather than thinking of this document as a history of your qualifications, think of it as a quick introduction that should lead to an interview. You may not have much time to spend working on a standout resume. If you want to create a resume that you can quickly adapt for each company you approach, consider using traditional favorites in a classic style. The program will prompt you to add pertinent information to our Word 2016 resume templates and can be confident that the results will be impressive enough to gain the attention of hiring managers. If you’re familiar with Word 2016, you may already have an idea of the variety of contemporary features you can add to your resume. These elegant designs provide the option of adding a bit of creativity to the format, including colors or a format that displays familiarity with emerging technology. Take a look at our modern Word 2016 resume templates if you’re looking for a job in a high-tech profession. As you search for a new job, whether it is your first or your tenth, a basic, straightforward document can be an excellent way to represent your best side. With the help of our Word 2016 resume templates, you can create a clean document with streamlined organization and just the right amount of color to attract the attention of hiring managers. These templates are appropriate for most career phases and in most industries. Word is a familiar tool in many offices, and as you seek a position in a professional industry, trust our Word 2016 resume templates to guide you through the creation of a resume that is useful in a wide variety of situations. For a professional document that is ready in a pinch, check out some of our proven and popular templates. When you’re fresh out of graduate school, your resume must show that you’ve gained work experience outside of the classroom. Without the same workplace history, your resume must show that you have both the opportunities and the desire to succeed in the position. Personalize one of our entry-level Word 2016 resume templates to bring your pertinent information forward. There are clearly some phrases you should not include in your resume, including anything too cliché, insensitive, or controversial. Word 2016 resume templates and tips can help you avoid these traps. Your choice of words and overall content may affect whether you get that interview, so be very careful to include the right words. Use our guide to avoid common mistakes. Include your full legal name, and avoid using nicknames. Update your email address. Your personal email may draw attention to your favorite hobbies ([email protected]), but for your resume, choose an email that is professional ([email protected]). Your home phone number or cellular number is appropriate for your resume. Don’t use your work numbers, if you can avoid it. If you aren’t comfortable sharing your home address, it is acceptable to list your current home city. Many modern employers expect to see some type of social media presence. You don’t have to include them, but if you have LinkedIn or similar professional social media pages, you may want to include the URL on your resume. A summary statement, sometimes called a resume profile or summary of qualifications, is a few short sentences that draw attention to your specific qualifications, the value you bring to companies, and professional achievements. Although this paragraph is brief, it should give a clear picture of the potential you’ll have as an employee. An objective statement, still located at the top of the page, describes what you hope to accomplish or gain from an employer. In most cases, an objective statement isn’t appropriate. Only use these statements if you are just entering the job field, switching from one industry to another, or graduating without pertinent job experience. Expand on the information you shared in the summary statement in a list of your most impressive skills. Most employers appreciate a concise list of four to six of the most pertinent skills. If possible, choose your skills directly from the job listing. You may be able to use the exact keywords. This will help your resume make it past application tracking systems. The work experience section is typically the lengthiest in the resume. Begin with your most recent work experience and move in reverse chronological order. When listing each position, include the company name, your responsibilities, professional accomplishments, and specific metrics. Begin each sentence with a strong action verb to create an active picture for recruiters. In this final section of your resume, share the highest level of education you’ve achieved. You can also include pertinent training, continuing education, and professional certification courses you’ve completed. In addition to benefiting from the guidance of our Word 2016 resume templates, check out our other resume building tools. We offer a resume builder that helps you customize each document with the talents, skills, and achievements pertinent to each job advertisement. It’s easy to revise your documents with this guide. The process is convenient and easy. • Step One: Answer questions about yourself, regarding experience, accomplishments, and skills. The program will put your information into appropriate formatting. • Step Two: Download the resume and prepare to deliver the hard copies and digital versions. Be sure to choose at least one ATS-optimized template if you hope to submit digital resumes. • Step Three: Review the document for typos and other mistakes using the resume building tools. These tools include access to select keyword phrases, tips specific to your chosen industry, cover letter tools, and interview advice. • Step Four: Submit your completed resumes.